In these days of globalisation and music-like-water it is a delight to write about leading soloists and musicians, including members of the Berlin Philharmonic, working together for a really important cause. International Physicians for the Prevention of Nuclear War (IPPNW) is a non-partisan international grouping of medical organisations dedicated to the abolition of nuclear weapons. They work with the long-term victims of nuclear explosions and accidents from Hiroshima to Chernobyl. Their work has been recognised with the 1984 UNESCO Peace Prize, and 1985 Nobel Peace Prize. For the last 21 years IPPNW-Concerts has been working from its Berlin office with top musicians world-wide to raise funds for their work. As well as being a fantastic cause there is some music well worth exploring available on IPPNW-Concerts' own CD label, and in co-productions with Swedish label BIS. These are all live recordings of concerts promoted by IPPNW over the years. There are forty-nine CDs in the catalogue with composers ranging from Monteverdi to Elliot Carter. The nuggets worth mining include Furtwängler's Te Deum coupled with Brahms and Hindemith (CD40). Wort und Musik - 60 Jahre nach Hiroshima couples the aria from Bach’s Goldberg Variations, Shostakovich's String Quartet No 8 and Schubert’s Quartettsatz with texts from an eclectic group of writers including Mohammed El Baradei, Till Bastian, Claus Biegert, Pierre Curie, Enrico Fermi, Albert Einstein, Robert Jungk, Sadako Kurihara, Robert Oppenheimer, Franklin D. Roosevelt, Ernest Rutherford, Leo Szilard, Edward Teller. All IPPNW CD’s can be bought from their web site, and the service is fast. My purchase reached the UK in two days. 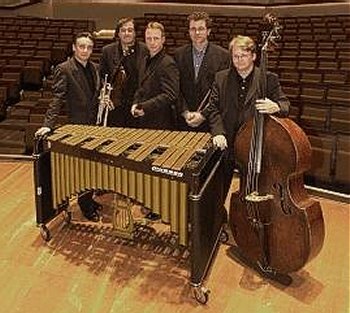 One of my personal favourites in IPPNW's catalogue is the Berlin Philharmonic Jazz Group (see above) playing live in 2004 in the Philharmonie in Berlin with the world-famous baritone Thomas Quasthoff. This recording was made at a concert for 'The Right Livelihood Award' which is the 'Alternatative' Nobel Prize. Quasthoff who is better known as a classical singer was the recipient of a Grammy Award in 2004. Appropriately the programme opens with Ed Harris’ Freedom Dance. The Berlin Philharmonic Jazz Group also played in the 2001 "IPPNW-Benefit Concert for the Memorial of the Murdered Jews of Europe" (available on CD 37). It is great to hear top orchestral musicians swinging. Other reader recommendations of jazz groups from the symphonic world are very welcome as comments on this post. IPPNW co-productions with BIS also contain some real gems. My own favourite is a live Missa Solemnis from the Philharmonie in Berlin with Antal Doráti conducting the European Symphony Orchestra, University of Maryland Chorus, and a distinguished group of soloists. Can any readers post any more information on that concert, particularly the involvement of the US chorus? Also available exclusively from IPPNW is Doráti's posthumously published book "For inner and outer peace." The title of the book (which is dedicated to IPPNW) comes from the words inscribed in Beethoven's own hand in the score of the Missa Solemnis over the line in which the "dona nobis" motif first appears. The wide-ranging work of AntalDoráti has been featured on an overgrown path recently. 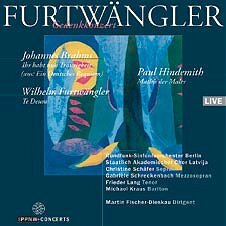 Another BIS co-production recorded at the Philharmonie with the New Berlin Chamber Orchestra and members of the Czech Philharmonic and HdK-Chamber Choir conducted by Martin Fischer-Dieskau includes two of Doráti’s own compositions (his Pater Noster, Prayer for Mixed Choir and Jesus oder Barabbas? a melodrama after a story by Karinthy Frigyes for Speaker, Orchestra and Choir) alongside works from Bartok and Martinu. Also on BIS are recordings of Doráti's 1st and 2nd Symphonies, although these are not part of the IPPNW project. Finally among the BIS co-productions a live Mahler Symphony No 9 with Rudolf Barshai conducting the Moscow Radio Symphony Orchestra is a rarity well worth investigating. All proceeds from the sale of these CDs benefit those in dire need as a result of war, industrial and natural catastrophe. Need I say more? Pliable, here is a bit of further information on the University of Maryland Chorus. The University of Maryland Chorus was founded in 1967, under Paul Travers, a musical colleague of Antal Dorati and a visionary choral musician in his own right. The University of Maryland Chorus was one of the leading vocal ensembles in the United States, and performed the established symphonic-choral repertoire as well as premieres of new works, both domestically and internationally. The Chorus performed in major concert halls in Dresden, Moscow, Berlin, and London in 1988 and played at major music festivals in Germany and Belgium in 1990. In 1994, the Chorus toured in Europe with performances of Verdi's Requiem in Berlin, Moscow, and Paris. The Chorus has recorded on the BIS, Educo, London, and Pro-Arte labels. Under Paul Travers, the University of Maryland often collaborated with the National Symphony Orchestra under Antal Dorati and Mstislav Rostropovich. The Chorus also participated in the internationally renowned Maryland Handel Festivals which took place in the 1980s and 1990s. Edward Maclary is currently the director of the Chorus. When I see titles like this, I feel sick. Where are the musicians who remembers the 100,000 civilians who died in the largest urban battle of the Pacific War -- more than at Hiroshima?? The 100,000 civilians who died in the largest urban battle of the Pacific War -- more than at Hiroshima -- are not remembered in beautiful candles floating down darkened rivers or in flights of doves soaring into the blue sky; there is no anti-American significance to their deaths. But they still live in the fading memory of that woman, who hid for two days in the smoldering ruins of the neighborhood until the first American patrols came into view. Thanks for those two previous posts. The beauty of blogs like on an overgrown path is that they lead to new discoveries. Readers who, like me, want to find out more about the Battle for Manila can start with this link and this link. The latter report which is headlined Battle for Manila reduced 'Pearl of the Orient' to rubble has many resonances with the bombing of Dresden which I recently wrote about, and which Shostakovich so movingly immortalised in his 8th Symphony which was given a wonderful performance last night at the BBC Proms under Bernard Haitink. Do any readers know of musical tributes to the victims of the war in the South Pacific we could explore? The purpose of my headlines is not to make people sick. It is to bring events such as these to a wider audience, and to encourage better understanding. Berend, you have a fine blog. I am sure it would be a great idea to use that to help people understand about the forgotten victims of the Pacific war and other atrocities. According to the United States Department of Energy, approximately 70,000 died from the immediate impact of the atomic bombing of Hiroshima, with over 100,000 dead by the end of 1945 due to fallout. 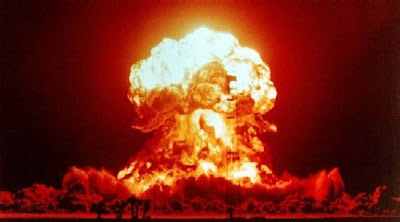 By the end of 1950, the U.S. government estimated that bomb casualities in Hiroshima alone could have exceeded 200,000. In Nagasaki, the U.S. government estimates that approximately 40,000 Japanese were immediately killed, with approximately 140,000 dead from radiation within 5 years. Thus, the U.S. government estimates that approximately 340,000 died within five years due to the impact and radiation effects of the two bombings. Readers may want to relisten to Krystoff Penderecki's Threnody to the Victims of Hiroshima (though Mr Penderecki later said that the title was an afterthought. The same cannot be said of Henryck Gorecki's in-progress Oswiecim/Auschwitz Requiem) or perhaps better, Toshio Hosokawa's Memory of the Sea -- Hiroshima Symphony, under Tadaaki Otaka on Chandos. Those who love literature and cinema as well as music will know of Masuj Ibuse's novel Kuroi Ame (Black Rain) from 1965, and Shohei Imamura film version of the novel, from 1989, with sparse music by Toru Takemitsu. The film version won the Japanese equivalent of the Academy Award, along with several other honors. Small correction to above post: It's Paul Traver, not Travers. I sang that Missa series, and many other concerts, with the University of Maryland Chorus. Dorati and Traver became acquainted, and then friends, through the Chorus's work with the National Symphony. Mitchell had used the U of MD Chorus, and when Dorati became the music director of the NSO, he did, too. Dorati used the Chorus for other performances as well, as the LvB Missa project demonstrates. We also sang under his direction with the Royal Philharmonic and Detroit orchestras. Traver and some members of the chorus (32 of us, IIRC) flew to Switzerland to sing in Dorati's memorial concert after his death. Solti conducted the Brahms Requiem. The soprano soloist for that was Barbara Hendricks, who, at rehearsal, broke down in tears. She had sung the Brahms with Dorati and the Royal Phil (as had MD Chorus); indeed, I think she must have been a Dorati favorite, for he used her for other concerts, too. The Missa concerts were Dorati's last. They took place in the summer of 1988; he died in November of that year. I was also privileged to sing with the University of Maryland Chorus for the Dorati "Missa Solemnis". His vision and musicianship were extraordinary (the UMD CD has tracks of rehearsals which include Dorati's explanantions and feelings on different parts of the mass). On the title page of the manuscript of the "Missa Solemnis" is Beethoven's handwritten dedication: 'For inner and outer peace'. Like Beethoven and Dorati, I always hope that music can be a catalyst for peace and tolerance throughout the world. I also sang in the Missa Solemnis in 1988. I was a member of the University of Maryland Chorus. Soprano. We sang in Dresden. Royal Albert Hall, Russia, Berlin.